Marketing versus Sales. Sales versus Marketing. Sales versus Marketing. Marketing or Sales? Two different sides of the same coin. One without the other… ineffective. Let me illustrate. Imagine walking into the new swanky restaurant in your neighborhood. The tables settings: picture perfect, the white linen: crisp, the attractive china: gleaming. The maître d’ seats you and presents the menu with panache; the busboy pours pure sparkling mineral water into your shiny crystal glass. You chat with the waiter about their specialties while a delicate string quartet plays in the background. You order a glass of your favorite chardonnay and the highly recommended crab cake appetizer. The wine comes but the waiter is gone. He’s in the kitchen, making your crab cakes. The service was terrific, but the food was terrible. The waiter is trained in hospitality not the culinary arts. 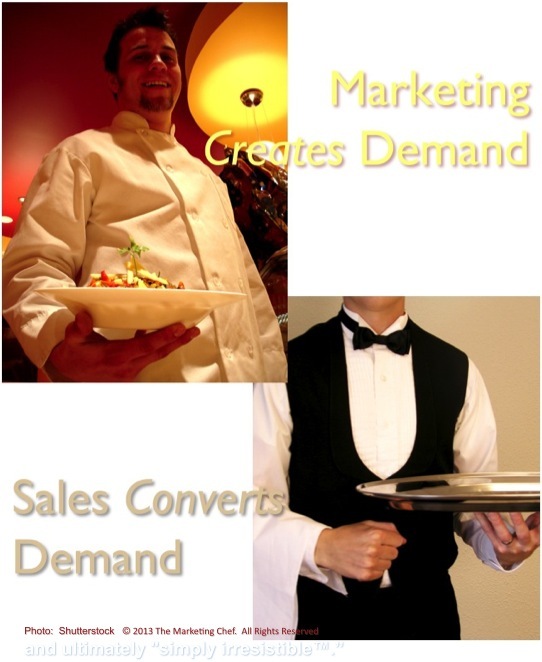 A restaurant where the waiters cook, is like a business where sales does all the marketing. Now picture your favorite eatery and eliminate the waiters. The chefs are also in the front of the house serving the guests. Almost as bad, isn’t it? At least the food was pretty good! It’s 1980, I come to America for my first real job after college. I have the privilege of opening Skyway, a restaurant that spans between the towers of Hyatt’s flagship hotel in Chicago. From day one I have to carefully navigate the natural tension between the back of the house, the kitchen, and the front of the house, my wait staff. When they work in harmony my customer, the guest, benefits. When there’s a screaming match in the kitchen, when knives are wielded or my waitress takes her bad day out on the cooks, everyone loses. Organizations must manage the natural tension between the less visible back-of-the-house, (marketing), that puts together and positions your offering and the more visible front-of-the-house, (sales), that is in the trenches with the customer. You can’t have one side of a coin without the other. What does that mean for you as an entrepreneur or executive? Ensure your marketing kitchen is cooking up “simply irresistible™” demand, and, your sales team is converting that demand, listening to the customer, serving the customer. And please train them not to drop the dishes that marketing serves up. When marketing and sales get along you get the dessert! Contented customers that keep coming back. Great analogy … this clarifies the division of roles (between sales and marketing), but also the extreme interconnectedness of the two functions. Bravo!